Seventh grade students from The Bay School, with signs in hand, took to the streets of downtown Blue Hill on March 15 to protest a lack of action on the issue of Climate Change. 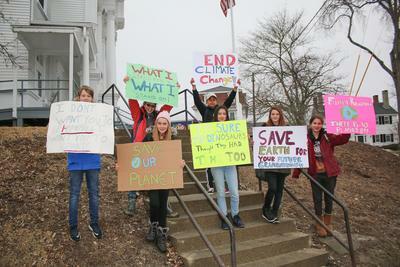 Holding large poster board signs with phrases such as “There is no Planet B,” and “I’m sure the dinosaurs thought they had more time too,” the students took to the streets of downtown Blue Hill to protest a worldwide lack of action on climate change. Participating as part of an international event scheduled that day, students Isla Day, Oona Sacaridiz, Julia Traub, Milo Fleming, Voilet Czuj, Sawyer Williams and Marie Nemith “fessed up” to ditching school (but just until noon) to make sure their voices were heard—along with students in more than 123 countries and 2,000 schools that were believed to have joined in. “We want to make the planet better for future generations,” said Traub. “If we can take one little thing out of the things we do each day, it will make a huge difference,” said Williams, speaking in support of Blue Hill’s recent ban on plastic bags, and advocating for more steps in that direction. Speaking in rapid fire the students listed a number of reasons why the issue of climate change was important to them. From the extinction of animal species to a more direct “This could kill us,” the students noted the likely “irreversible” nature of climate change, especially if no action is taken. “Not enough is being done to address this. It should be in the news everyday,” said one student.